This is the article published in the Hana Hou! Magazine this past summer. Some of the pictures included in the article are on a previous blog post titled Hana Hou! When Marcie Cameros first met Ray Dela Cruz, she was 21 and he was 47. She was childless and wanted kids, but he’d already had five—and that, he thought, was enough. When they were introduced at her sister’s house in Kane‘ohe, they fell for each other, though if you’d asked them the odds on whether they’d stay together, they both would’ve guessed they’d last a year, tops. But surprises happen, and in the case of Marcie and Ray, a lot of surprises. They stayed together a decade and, at the end of it, got married. After the marriage, Ray agreed to try for a child. But it wasn’t a simple proposition. He had had a vasectomy before he met Marcie, and it couldn’t be reversed. So the couple went to see fertility specialists, and the doctors managed to collect enough little swimmers to create nine tiny embryos. Doctors placed two in Marcie and put the rest into cold storage. One took, and nine months later she gave birth to a healthy baby boy whom the thrilled couple named Makaio. A year later they decided to try for another baby. Once again the doctors placed two embryos in Marcie. And then things got wild. Eight weeks into the pregnancy, on a Tuesday she’ll never forget, Marcie was on her way to work when she noticed she was bleeding. Fearing she might be having a miscarriage, she headed for the ER at Kapi‘olani Medical Center for Women & Children. A few tests later and her trepidation had turned to joy: She wasn’t having a miscarriage; she was likely having twins. Marcie’s mother, Dana, flew in from Moloka‘i to be there for her daughter’s regularly scheduled checkup a few days later. Marcie’s niece Chelae had come, too, so there were three of them in the room that Friday, all watching the screen, when the doctor started the ultrasound. Marcie saw three kidney-shaped beans on the monitor. Marcie looked at her mother and niece. “Is that three?” she asked the doctor. The doctor gave the nurse measurements for Baby A. Then for Baby B. When the nurse asked, “And Baby C?” and the doctor rattled off another set of measurements, Marcie, mother and niece all flipped: triplets. “I’ve got to call Ray,” Marcie thought. Her husband was at his job as a roofer, and all she could think when she dialed his number was: I hope he doesn’t jump off. Ray was four stories up when Marcie called, but he didn’t jump. He also didn’t believe it when she told him about Baby D. “I’m serious, Ray,” she said. “So serious.” The couple was referred to a specialist to discuss terminating one or several of the fetuses. But that day at church Marcie had decided that she was all in, come what may. And Ray told her he would support any decision she made. It would be another whole month of weekly checkups before Baby E was discovered. This time everyone was there: Ray, Dana, Chelae and, of course, Marcie. The doctor was scanning way over by her kidneys when he said, in the most matter-of-fact way, “I think there’s another baby in here.” Doctor and technician went back and forth for a good three minutes before they announced that yes, there was definitely a Baby E. Marcie’s mom squeezed her daughter’s hand, both in disbelief. The odds of what was happening now were somewhere between one in thirteen million to fifteen million. One of the embryos had remained whole and was developing into a girl, but the other had split and split and split and was developing into four identical boys. And now the risks to Marcie and the babies she was carrying were very real. Two of the boys had what’s known as twin-to-twin transfusion syndrome, where one essentially steals the other’s nutrients. If the smaller one were to die, the larger one might, too, and the others might suffer strokes. That could force Marcie to go into early labor. Born so young, all of the babies, if they even survived, would likely have catastrophic disabilities. Marcie was at the twenty-three-week mark when doctors discovered she was dilated and having contractions. She was shot up with hormones to stave off delivery, admitted to the hospital and remained there until she gave birth six weeks later. All five of the babies were delivered by caesarean, all one minute apart, on October 10, 2015, between 5:02 and 5:06 p.m. Keahi was the smallest at one pound ten ounces; the girl—Kamali‘i, or “royal child”—was the largest at two pounds, eleven ounces. All were perfectly healthy despite their elfin size. They went straight to the neonatal ICU and stayed there, growing and gathering strength and gradually being released out into the world until the last two went home on Christmas Eve: the first known quintuplets ever born in the Islands. Even more astonishing, they are the first quintuplets with a set of identical quadruplets known to have been born anywhere, ever. At home, life was a whirlwind. Sixty diaper changes a day. Feedings every three hours for a total of forty a day. The babies wore color-coded wristbands so everyone could tell them apart. After four months Marcie had it down, and after five and a half months Makaio did, too. Ray still gets them confused occasionally. The couple continue to take their days on faith, even now a bit stupefied by the fact that they have five babies. And the babies never let their parents forget it. They are everywhere in the house, like a circus act or an optical illusion. They are incredibly good as babies go—they’ve learned to self-soothe, and they are almost perfectly in sync: When one gets sick, they all get sick and then it’s over. All gave up their pacifiers at the same time. All began to sleep through the night at the same time, “like they had some sort of mental telepathy conference,” says Marcie. Just what made that embryo split and split and split? Who knows? Marcie was taking the standard regimen of hormones, but both she and Ray have abundance running through their gene pools—Ray especially. He’s one of seventeen siblings. His mom was a twin, his sister had twins and one of those twins went on to have triplets. There are twins on Marcie’s mother’s side of the family, too. 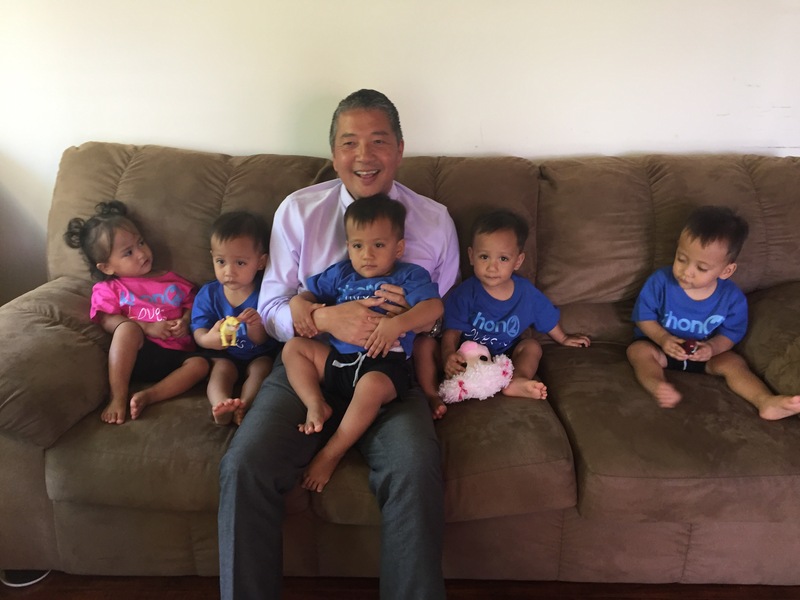 Marcie and Ray Dela Cruz and their 14 month old quintuplets Kapena, Kaolu, Kamalii, Kupono, Keahi and their older son Makaio at their home in Pearl City and at Sand Island beach park. I’ve been so emotional lately. Happiness, sadness, wonder, disappointment & hope have been on my heart and mind lately. I don’t understand many things that have happened in my life. All the bad, and strangely, mostly the good. How was I chosen to live this life? I feel underserving, but so very grateful. I don’t even know how to describe what I’m feeling. What I absolutely know is that I will never be able to express how blessed I feel each and every day. I know that my experiences in life have taught me to learn from my past, deal with the present, to love life, and live for today. I know that God could not have chosen another person to love my children more than I do. I know that God gave me these gifts, and was there with me the entire time. He carried me and held me through the scariest time of my life. He kept me calm, He kept me healthy, and He watched over us all. A meeting convened one day in Heavens Sacred Hall. The ideal Mother must be found for Quints so sweet and small. She must be patient, first of all, and kind, and calm, and wise. And capable of chasing tears away from little eyes. She’d have to put her children first and be so very smart. Have dedication and resolve; a sweet and loving heart. Yes, heaven found the perfect one and sent those Quints to you. Thank you for making me a Mommy. You were my first blessing; the one I never thought possible. The moment I found out I was pregnant with you was the happiest moment of my life. I loved you instantly. You brought so much joy to my life and continue to surprise me with your attentiveness, charm, talent, wit, and unconditional love. You teach me something new every day and are the best big brother to your babies. This is the third year I get to celebrate Mother’s Day. I thank God every day for choosing you for me. Today I celebrate you, your brothers and your sister. I am honored to be the one you all call Mommy. The big reveal…it’s a BOY! I love you. Thank you for being you. Thank you for your unconditional support, encouragement & love. Whenever anything exciting happens, I think of you. Whenever something funny happens, I tell you. Whenever something bad happens, I need you. Through it all, you are there. You know me better than anyone else on this earth. You shaped me into the person I am today. You are my best friend and I’ll never take you for granted. You’ve taught me so much about life, whether you intended to or not. I wish I could spend every day with you. I hope you know how much you mean to me. Happy Mother’s Day, Mommy! Eighteen months. Still in disbelief of it all. Here are some precious pictures of the babies during the first few weeks of their precious little lives. While in the NICU, I was hesitant to post any pictures of the babies. I had many reasons, but mainly because I didn’t want people to talk about them as if they were weak or sick. I didn’t want any negativity surrounding my babies. Now that they’re 18 months, I look back and am thoroughly amazed at how far they’ve come. These babies are my heroes who overcame so much in such little time. I am still so amazed, blessed beyond measure and will never stop experiencing “Post-Partum Appreciation”. Thank You, Heavenly Father for these blessings. Last night I said “Kaolu, come here” and guess what happened? He came. In that moment I had a realization that my babies aren’t babies anymore. Sure, they’ll always be my babies, but really, why are they growing so fast?